No boat? No problem. Round up your crew, take the helm and head out on a voyage of boating discovery. Boat clubs, rentals, charters and peer-to-peer options let you enjoy a wide variety of boating adventures—from fishing to cruising to sailing or water sports— even if you don’t own a boat. 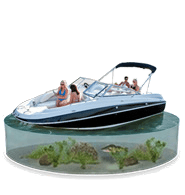 They’re also a great way to try different boat types if you’re thinking about buying a boat or trading up to a bigger model boat. Dreaming of cruising on open water? Owning a boat puts you at the helm.